So you’re one of the lucky ones who received an iPhone 4 (or iPad, or Kindle, or Android) for the holidays. After you get over your initial excitement and manage to set up your new digital plaything (here’s a tip—buy a protective case), you still have one more task before you: get rid of your old electronics, which suddenly look so sad and obsolete. I know, it might be tough to let go of that old iPhone (or Blackberry or Nook or Palm), but this is the circle of electronic life. What was once must have must now be replaced, because that is the will of Steve Jobs and the $175 billion U.S. consumer electronics industry. But you can’t just throw those old phones and laptops into the trash—at least not in 24 states including New York Pennsylvania and Vermont, where as of 2011 it will be against the law for electronic goods to end up in landfills. You can find the full list of states at the website of the Electronics TakeBack Coalition, but even if you don’t like in one of them, it’s worth taking better care of your electronic waste—otherwise known as e-waste. From TVs to computers to phones, electronics can contain lead, mercury, cadmium and other potentially harmful chemicals that can often leach from landfills, contaminating the environment—and eventually human beings. We produce a lot of e-waste—3 million tons a year, according to the U.N.—and far too much of it still ends up in the trash, whatever the laws say. The answer? E-cycle your e-waste. The easiest way to do this is by simply passing along your old electronics to a friend or family member—something I did with an older laptop this holiday season. The planned obsolescence of many consumer electronics—especially cell phones—means that products are often pulled from the shelves and replaced with new models long before they’ve actually reached the end of their lifetimes. And if there’s no one you know to use your old electronics, try contacting a charity. Cell Phones for Soldiers allows you to easily donate your old handset to a member of the military. You can also sell old phones to websites like Flipswap, which then markets them overseas. (Flipswap will wipe the data off you electronics when you hand them over, but it’s worth doing that yourself first.) And please—make sure the electronics you’re donating still work. Otherwise you’re just giving them garbage. If you can’t give away your old computers and cell phones, you can recycle them—but only the right way. It’s first worth checking out whether your original retailer will accept the product for free recycling. Many do—including Dell, which will even pick up your old computer from your house. Sometimes it’s even worth money—bring an old iPod for recycling to an Apple store, and you can get 10% off a new one. Staples allows you to bring in virtually any old electronics for recycling—even products that weren’t bought from Staples. And if none of these options work, you can contact a recycling company directly. 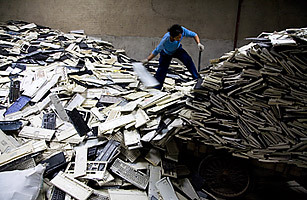 But make sure it’s a the right one—an NGO called the Basel Action Network, which works with e-waste, has a list of e-stewards, recycling companies that will responsibly dispose of old electronics. Everywhere you look you see pieces of circuit boards, televisions, refrigerators, irons, etc. The toxic chemicals released are spread throughout the area when it rains and of course spread to the homes each evening. What especially troubled me was the path of the toxic smoke that floats right into the food market. So whatever doesn’t get into your lungs can now settle onto the food supply of Accra. Agbogbloshie is a large thriving recyclers market but has major environmental health problems. The only way to slow down the supply of unregulated e-waste is to take better care of the old products we have—especially when we’re disposing of them.